For months and months, I’ve flitted between social obligations — those of friends and family — with the sort of nervous energy that could be mistaken for levity. No matter where I was, I was thinking of what I had to do next. That’s not to say that I can give any resolution to that problem. I struggle with it daily. Freelancing and school are very similar in that they are glacial. The majority of your work is not done on the surface, in a classroom or an office, but on your couch or in a coffee shop, if you’re feeling up to it. You may show up to a test or a photoshoot, but you spend long hours alone before you’re there. Downtime can be healthy or unhealthy. For months and months, I’ve felt a cloud over me. Nothing I said was the right thing. The decisions I made that felt progressive at one time felt lateral at best. I was standing still and running in circles all at once, attempting to strike the balance of social claustrophobia and isolation that I’ve never quite gotten right. I struggle with it daily. And then, right on time but when I least expected them, the azaleas outside my house exploded. Relentlessly pink, a vibrant magenta that resembled more of a firework than a common bush. I can never keep track of when the Japanese magnolias bloom or the azaleas explode; I only know it’s all at once. Nothing heralds warm weather like azaleas for me. When I was little, I was painfully allergic. They were a flashy affront on my sinuses despite being my favorite color. Though I knew then that they were the first sign of spring, which meant more color, which meant summer would be here soon. Now, the sensitivities have subsided. 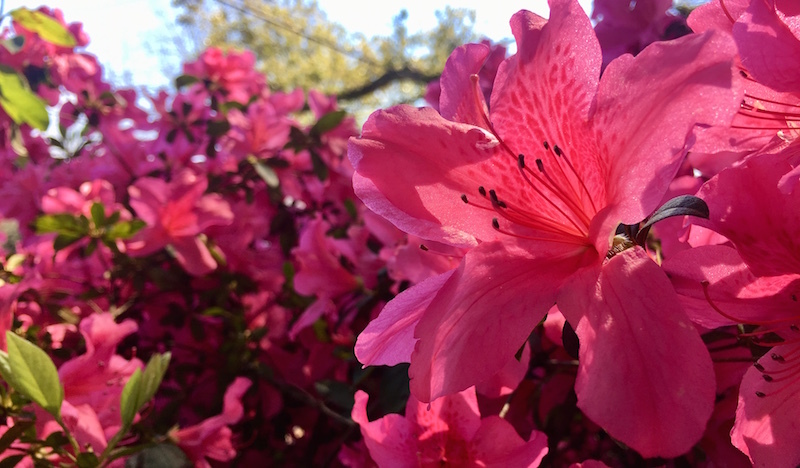 When I literally run in circles around town, marking each mile while my body acts as a metronome, I see miles and miles of the azaleas. It looks saccharine, and like a place where no one could ever feel a cloud over them. I outrun it the best I can, although it doesn’t always work. When you feel like there’s a cloud over you, it’s not something simply solved by thinking positively, or bullet journaling, or getting regular exercise at the gym (three days a week). It’s just not that simple, and all the anecdotal advice your friends and family dole out can feel more alienating than helpful. Although it doesn’t always work, being reminded that time is, in fact, moving as linearly as ever lends a certain comfort. Even if it is just flowers. Even if I may always struggle with it daily. I still run around in circles, but I can enjoy the view.